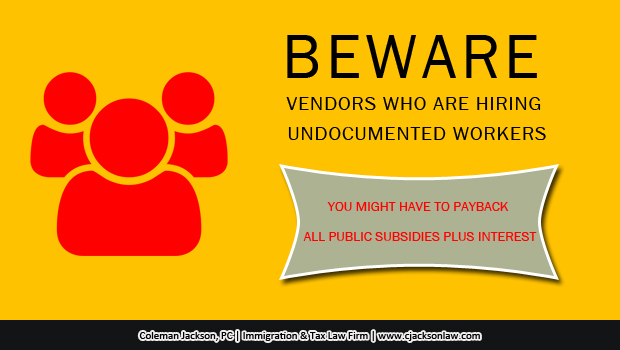 Texas Government Code §2264.051 stipulates that vendors doing business with any public agency, state or local taxing jurisdiction, or economic development corporation in Texas must certify in writing that the business, or a branch, division, or department of the business, does not and will not knowingly employ an undocumented worker. The certification statement must also stipulate that if, after receiving a public subsidy, the business or a branch, division, or department of the business, is convicted of a violation under the Immigration and Nationality Laws of the United States, 8 U.S.C.A. §1324a(f), the business will repay the amount of the public subsidy with interest, at the rate and according to the other terms provided by an agreement under Texas Government Code § 2264.053, not later than the 120th day after the date the public agency, state or local taxing jurisdiction, or economic development corporation notifies the business of the violation. INA, 8 U.S.C.A. §1324a essentially deals with persons or entities that violate the U.S. immigration laws by hiring, or recruiting or referring for a fee for employment in the United States an undocumented person. A person or entity charged with violations of 8 U.S. C.A. §1324a may establish that it has compiled in good faith with the requirements with respect to the hiring, recruiting, or referral for employment of an alien (illegal alien is the term used in the INA to refer to an undocumented person or a person who came to the U.S.A. without inspection or overstayed their visa) in the United States. Anyway, If a person or entity charged with a violation under 8 U.S.C.A. §1324a, establishes an affirmative defense, a conviction could possibly be avoided, and the person or entity doing business with a Texas public agency, state or local taxing jurisdiction, or economic development corporation could probably avoid the penalty of repaying Texas all public subsidies received with interest under Tex. Gov’t Code §§2264.051-2264.101. A public agency, local taxing jurisdiction, or economic development corporation, or the attorney general on behalf of the state or the state agency, may bring a civil action to recover any amount owed to the public agency, state or local taxing jurisdiction, or economic development corporation against any person or entity convicted of 8 U.S.C.A. §1324a violations pursuant to Texas Government Code Section 2264.101. This entry was posted in Business Immigration, Taxation and tagged contracts, government contracts, local government, public subsidies, taxes, Texas on August 27, 2015 by Coleman Jackson. 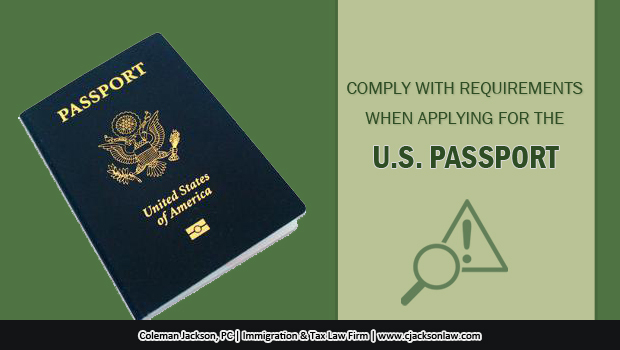 COMPLY WITH REQUIREMENTS WHEN APPLYING FOR THE U.S. PASSPORT, The Consequences for Not Complying could be Severe! 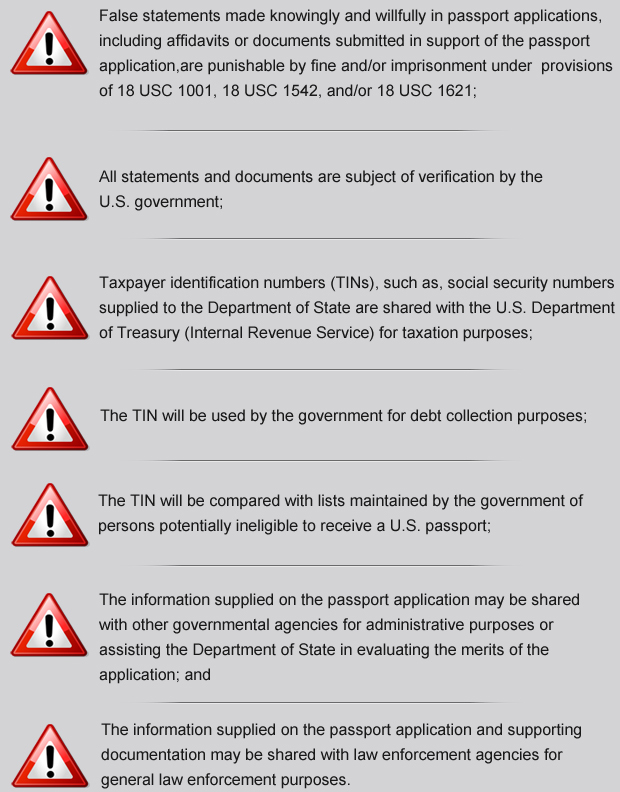 The IRS has published final regulations implementing IRC §6039E in Treasury Regulations Section 301.6039E.1 Information reporting by passport applications – a detail analysis of the types of information required of passport applicants when applying for the U.S. passport after July 18, 2014. Passport applicants who fail to supply complete and accurate information in a timely manner may be subject to a penalty of $500 per application. Prior to assessing the $500 penalty the Internal Revenue Service (IRS) will send the applicant a written notice requesting the missing information or requesting correction of the erroneous information. Applicants inside the United States are given 60 days to supply the missing information or correct the erroneous information. Passport applicants outside the United States are given 90 days to make appropriate corrections or supply missing information. If the passport applicant shows reasonable cause to the satisfaction of the Internal Revenue Service, the $500 penalty can be waived. The burden is on the applicant to demonstrate to the satisfaction of the IRS that the failure to supply complete and accurate information on the passport application is due to reasonable cause and not due to willful neglect. The IRS looks at all the surrounding facts and surrounding circumstances when making ‘reasonable cause determinations’ based on the passport applicant’s reasonable cause defense. Typically, suspected fraudulent passport applications are referred to the appropriate Passport Agency’s fraud office. A fraud prevention specialist is assigned and typically will run a series of checks to determine whether there is a likelihood of fraud. Upon making a determination that the passport applicant is likely an imposter or fraudster, the case is typically referred for further inquiry to the Diplomatic Security Service, which is the law enforcement branch of the Department of State. Ultimately, all this could lead to a criminal complaint against the passport applicant alleging commission of crimes under 18 USC. Applicant’s should exercise due care and diligence when completing the U.S. passport application and submitting substantiating documentation. Conflicts between the U.S. passport application and the supporting documentation and conflicts within the documents could create a lot of headaches and heartaches. And unreasonable and unexplained conflicts could lead to fines and/or imprisonment. This entry was posted in Business Immigration, Family Immigration, Taxation on August 14, 2015 by Coleman Jackson.